Samuel and Esther Russell were two of San Ramon's earliest pioneers. Their substantial ranch was purchased from Jose Maria Amador in 1851-2, a property which today includes the Forest Home Farms Historic Park. On November 20, 1852, Samuel became San Ramon's first postmaster. The Russells were Mormons who traveled to Salt Lake from Nebraska with the Abraham O. Smoot-Samuel Russell expedition from June to September of 1847. They made this move to escape religious persecution and find new opportunities in the west. He and Esther (1816-1855) became disenchanted with the Mormon faith and migrated to California with their children, leaving his other wives behind. According to Mormon records, he was excommunicated in 1850 just before they left for no longer believing the Bible or the Book of Mormon to be revelations from "the Almighty." Another source states he got gold fever and "ran off" for California. The family drove a band of gentle cows west with them. 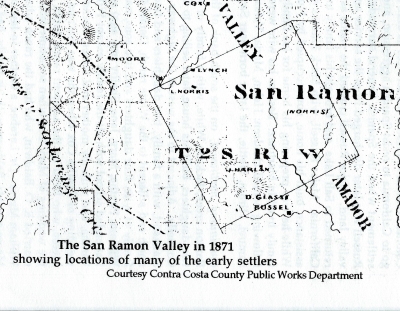 In those days, the San Ramon Valley was wide-open country. Herds of deer, antelope and elk ranged the hills with many grizzly bears around. Mission San Jose grazed cattle and sheep grazed in the valley until Mexican ranchos took over in the 1830s. Shortly after they arrived, another child, Brunette, was born near Sacramento. Six Russell children were raised on the ranch in San Ramon. Russell evidently used the cows, other livestock, a wagon and some cash to pay for 750 acres of Amador rancho land in 1851-2. The Russell property was just south of the Norris League and extended to today's county line. He and carpenter Mark Elliott from Tassajara built the Russell home using redwood from Moraga's hills. Soon after the house wss done, a barn was constructed to support their barley, wheat and hay crops and cattle-raising. Russell served as San Ramon's first Postmaster from 1852-1859 and probably had the post office in his home. The main road from Mission San Jose to Martinez passed by their ranch. Just to the north, a small village was established which had several names over the years, including Brewinsville (for the first blacksmith) and Limerick (for the many Irish). It finally became San Ramon. In William Brewer's book, Up and Down California 1860-1864, Russell told Brewer that, after the large 1861 earthquake, a brook with good water was "broken out" which added $5,000 to his farm's value. Russell passed away in 1863 at San Ramon but he definitely left his mark. Today Forest Home Farms Historic Park includes 16 acres which once belonged to Amador and Russell. Efforts to restore the Russell barn are currently under way. Pictures and information, courtesy the archives of Museum of the San Ramon Valley, Contra Costa Historical Society and Forest Homes Farms Historic Park. Smith, James D.,"Coming of Gringo to Contra Costa" in Daily Gazette- Martinez, June 11 and Sept. 22, 1925. Thompson, Nancy, Forest Home Farms, draft from Forest Home Farms Historic Park archives. ------------, The Samuel Russell Family, draft from Forest Home Farms Historical Park archive. Includes a wide variety of sources, including the County Records.